Free Shipping Included! 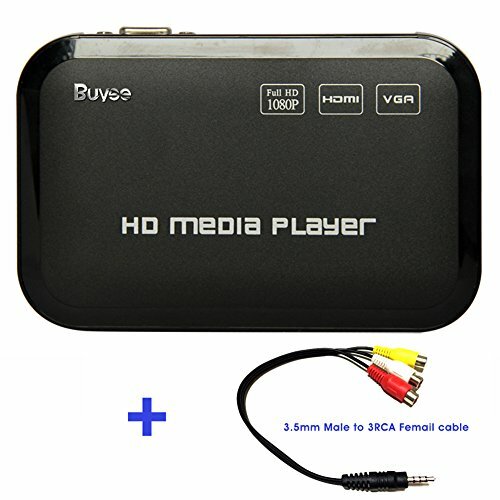 Buyee Portable Full 1080p Hd Multi Media Player 3 Outputs Hdmi, Vga, Av, 2 Inputs Sd Card & USB Reader for Hdds or Pen Drives, Digital Auto-play & Loop-play by Buyee at Home Entertainment Centers Online. MPN: T123. Hurry! Limited time offer. Offer valid only while supplies last. Features: 1. Support RM/RMVB(Real8/9/10) /3D video decoding up to 1080p. 2. Support H.264(MKV,MOV,AVI) decode up to 1080p, WMV9/VC-1 up to 1080p. FLV, VOB, MPG, DAT, MPEG, H.264, MPEG1/2/4,WMV, TP etc. zoom, move up or down, color transform. NOTE: This item only support USB device/SD card, don't support internal hard disk. If you have any questions about this product by Buyee, contact us by completing and submitting the form below. If you are looking for a specif part number, please include it with your message.